Omi Iyalaje in her Green Goddess Popcorn & Tea Lounge. 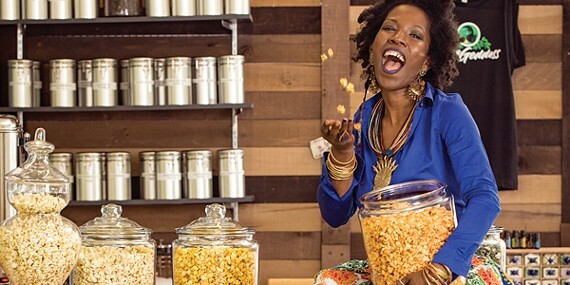 Omi Iyalaje, of Green Goddess, tells me that after 10 years of selling her popcorn at Whole Foods, she decided that it was time to extend the brand through her newly open Green Goddess Popcorn & Tea Lounge. You read that right: popcorn and tea lounge. Guests can hang out on the sofa or stuffed chairs, and there are a few four-tops and a large, low wooden communal tea table in this pretty, well-lit space. The key word here is communal. "This is an extension of my home," Iyalaje says. She operates a nine-week program through the business. It's open to women working through domestic violence, substance abuse, and poverty. In the program, they learn about good eating habits. They also work in the lounge — popping, seasoning, and bagging popcorn. Five cents of every bag sold goes to Iyalaje's nonprofit Green Goddess Global. Iyalaje also plans to have live music, movie nights, and a once-a-month tapas night. Iyalaje is a well-known vegan around town. She's been involved in a number of restaurants, including DejaVu. Among her line of vegan popcorns are the signature flavor Green Goddess with spirulina powder and cayenne; the barbecue-flavored Memphis Nile; Butter Me Down, V-Cheesy; Caramel & Cheddar; and Cinnamon Twist, a delightfully sweet popcorn with nary a bit of sugar. They range in price from $4.75 for a small bowl to $6.95 for large. A one-pound bag is $13.99. Iyalaje compounds her own teas, a skill she learned in college in Washington, D.C. Some of her teas are formulated to target specific issues. She has a couple of detox teas, and she says she can compound a tea specifically for the individual. 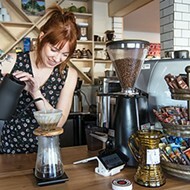 She offers specialty beverages: a superfood hot chocolate; a fresh ginger brew; and berrylicious and fruit punch lemonades. There are green teas and black teas and roobios teas. Her herbal teas come with intriguing names such as Get Smart, Love Your Life, and Wiccan Women's Brew. Her teas run from $3.25 per cup to $6.25 for a pot. Green Goddess also sells vegan pastries (brownies, cinnamon rolls, banana bread, and cookies) as well as spices and a small selection of gift items. "Our mission extends beyond popcorn," says Iyalaje. "We want our customers to love and nurture themselves." On Saturday, July 21st, starting at 10 a.m., the first-ever Taste of Memphis Vegan Food & Drink Festival will be held at Cook Lake near Frayser in Shelby Forest. "I went to a vegan event in Chicago," says festival founder Serena Lindsey. "I just thought I could bring it here." Everyone is invited, Lindsey says. "We want to promote healthy living/eating here in the Mid-South." The festival will feature a number of vendors, including 2 Vegan Sistas and A Taste of Soul, for sampling. The idea is to light the path to better eating without the judgment and with food that tastes really good. Lindsey, who became a vegan after a bad experience with meat, says this is totally possible. But she knows it won't be easy. "Spreading the vegan message is not very popular," she says. 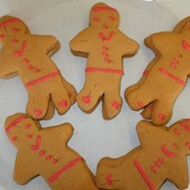 Taste of Memphis Vegan Food and Drink Festival, 10 a.m.-7 p.m., Saturday, July 21st. $15.